Remember when you were a child and got a set of crayons and coloring book? The book was printed with figures and designs. It was your job fill in the color between the lines. Be careful, a parent or teacher would say. Be neat. Don’t go outside the lines. There were no blank pages on which to scribble or be creative. You got a gold star for staying inside the lines, filling in all the shapes. Soon, you may have been bored and gone on to do something else. Perhaps the color intensity lessened as you hastily went on to the next page. Maybe, you went outside the lines on purpose to make your own mark. Working on a pre-printed pattern. Is there freedom for color choice? 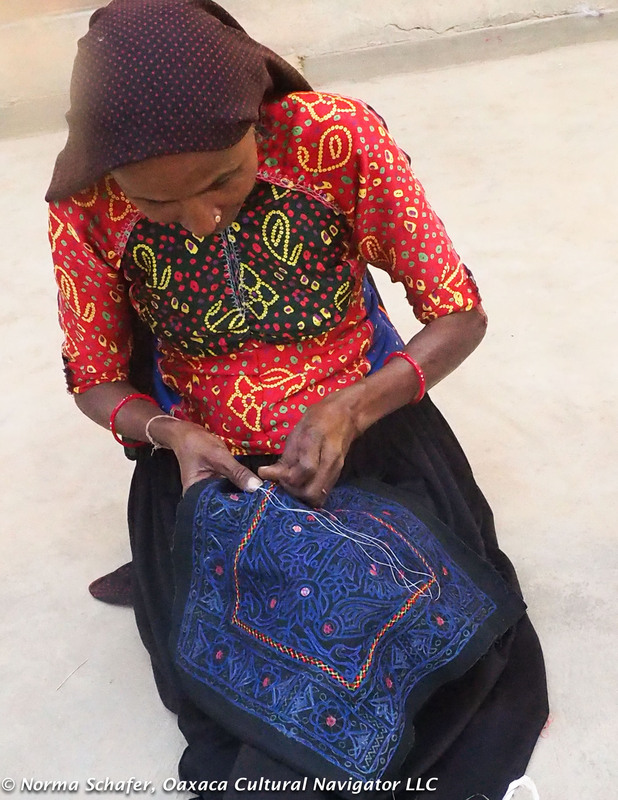 Yesterday we went to visit India textile expert Judy Frater at the NGO she runs in Adipur, about an hour east of Bhuj near the Gulf of Kutch and the Arabian Sea. 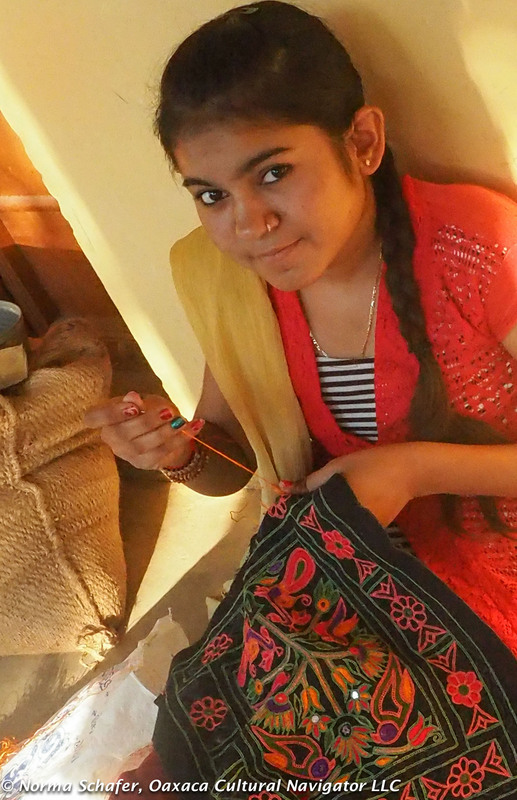 Before starting Somaiya Kala Vidya in 2014, Judy was the founding director of Kala Raksha, another NGO dedicated to textile promotion and development. 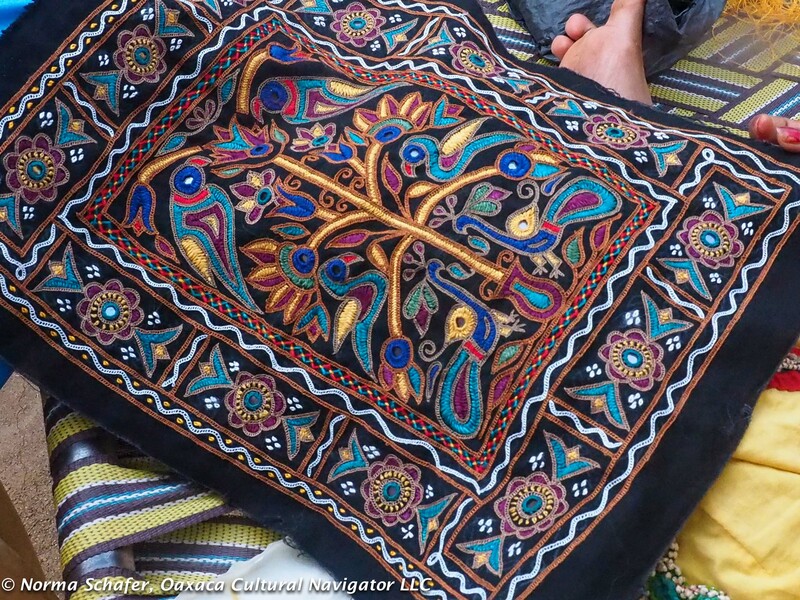 Today she works with indigenous artisans to provide education and training programs designed for cultural sustainability, market development, and indigenous identity. With Judy during my visit and with Salim Wazir the following day, I talked about the questions we discuss in Mexico that India shares. I suspect that these are pressing questions among artisans throughout the world. 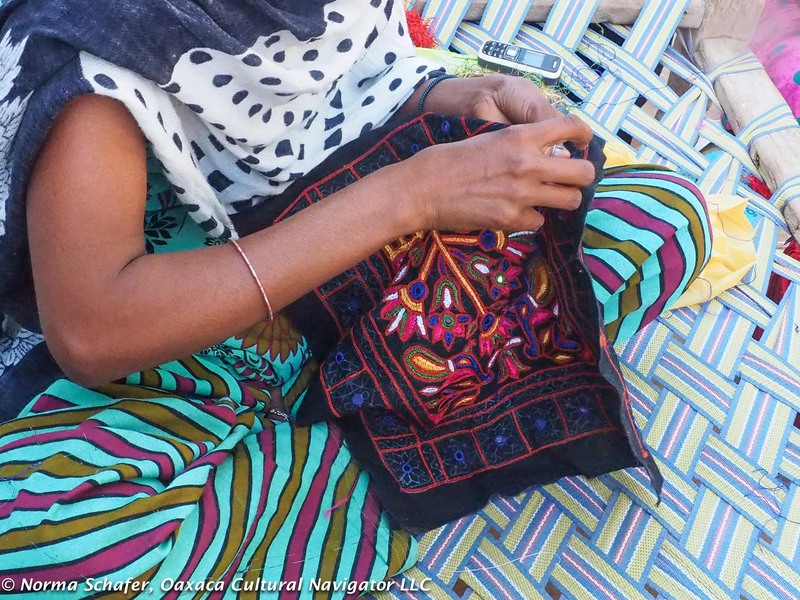 How do you create a sustainable craft enterprise without compromising an artisan’s innate creativity and urge for innovation? 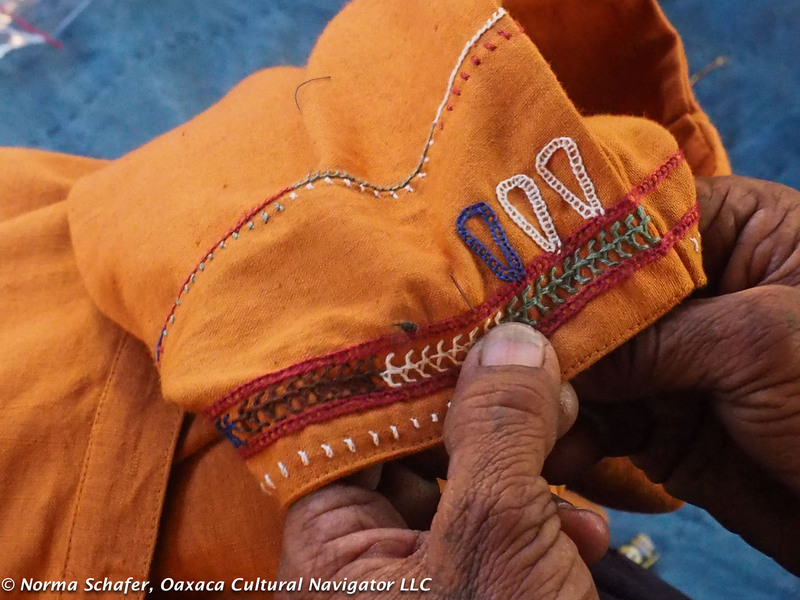 When a designer comes in to work with local artisans, employing his or her own drawings and hires the local artisan to execute them, how does this have an impact on craft preservation and design ownership? 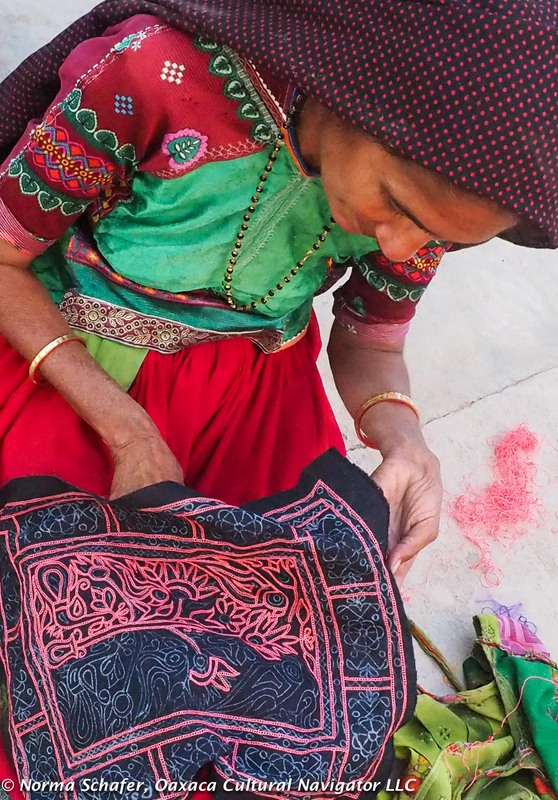 If NGO’s create cooperatives that then produce cookie cutter patterns printed on cloth that the embroiderers then fills in with silk threads in pre-selected colors, is this craft development or exploitation? If something is produced for the tourist market and not for personal or community use, what impact will this have for design sustainability? What compromises can be made to make sure that people work for fair wages, without being piece workers doing routine jobs for work they don’t own? Is paid work the only important consideration or does originality and integrity of communal design hold more value? 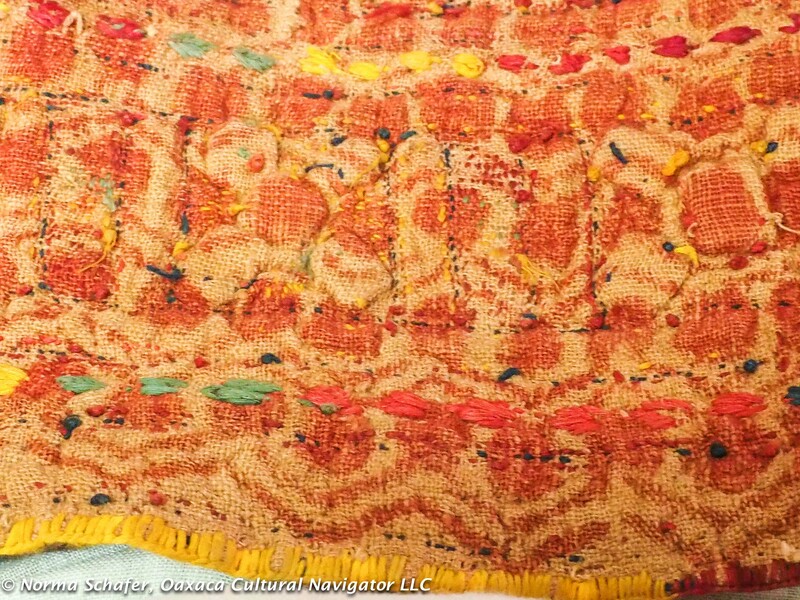 How will textile craft survive and who will decide its future? How would you answer these questions? I’m interested in hearing from you! 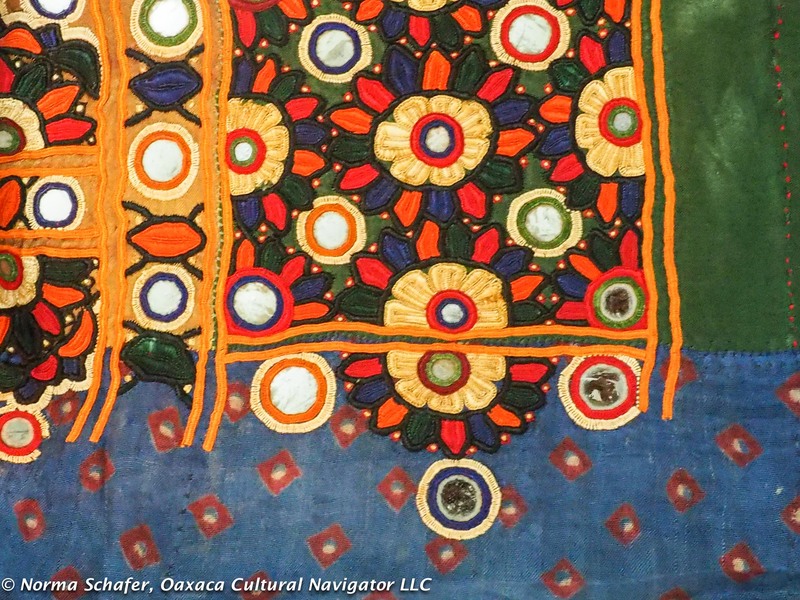 Mexico and India are both sources for great textile artistry. 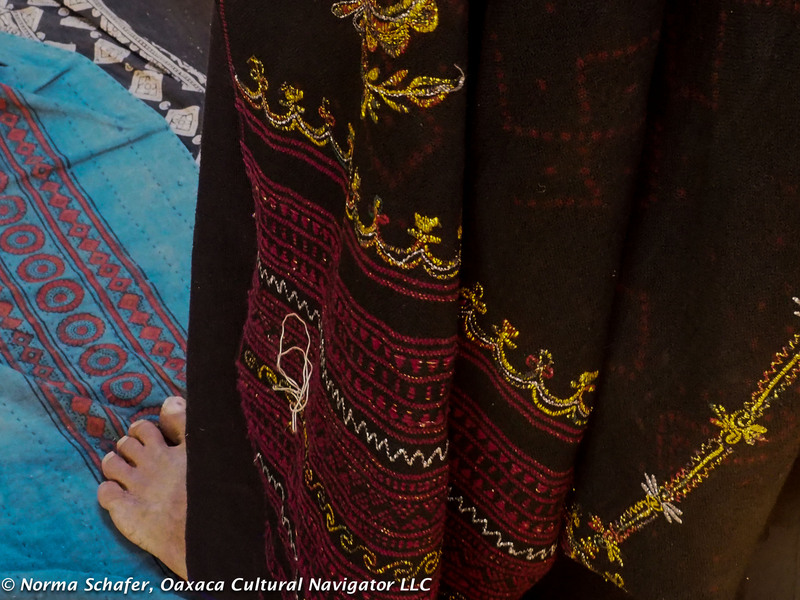 Weavers in Mexico have made cloth on back strap, flying shuttle and pedal looms for centuries and longer. 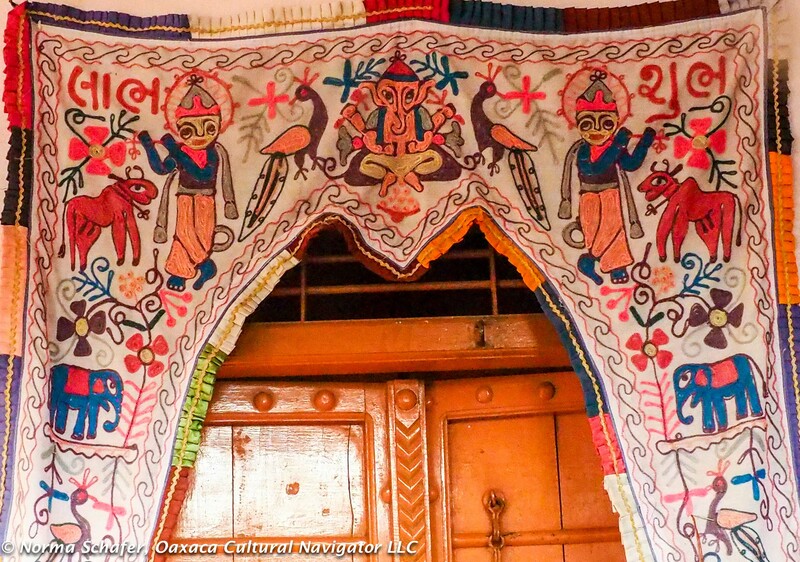 In India, artisans have been weaving cloth, dyeing it with natural colors and embellishing it with embroidery since Mughal conquerors and spice trade adventurers moved from central Asia and the Levant. She is beginning to fill in the blanks. 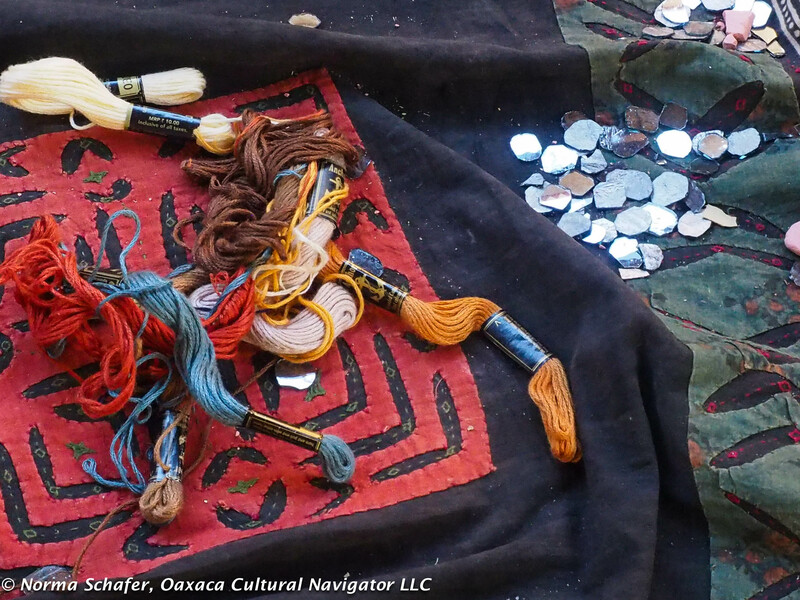 As tourist preferences drive the crafts market, most non-governmental agencies direct people to make things that will sell. Production uniformity is important to outside markets as collectors demand high-quality, perfect workmanship, and sophisticated design (in their point-of-view). The whimsy of asymmetry and uneven stitches seems to be losing ground in the commercial marketplace. 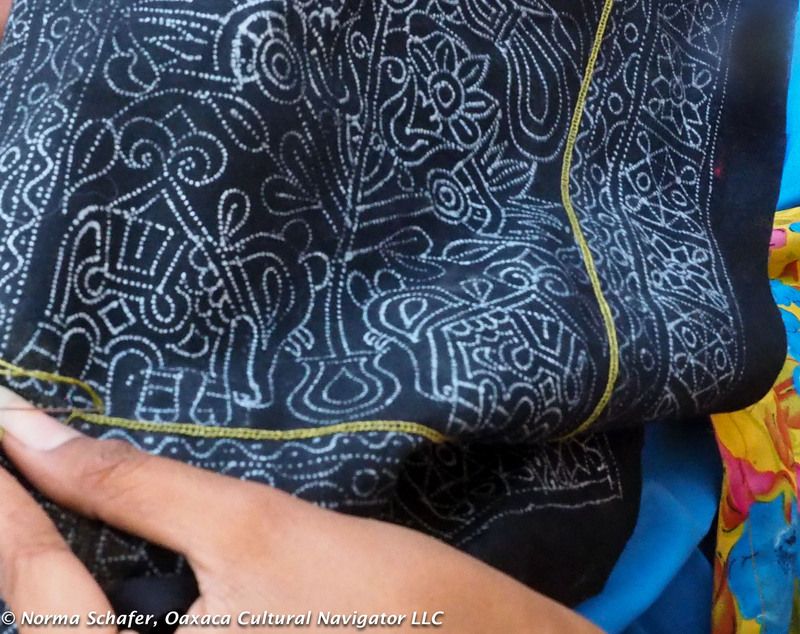 Only foreigners are interested in tribal textiles. 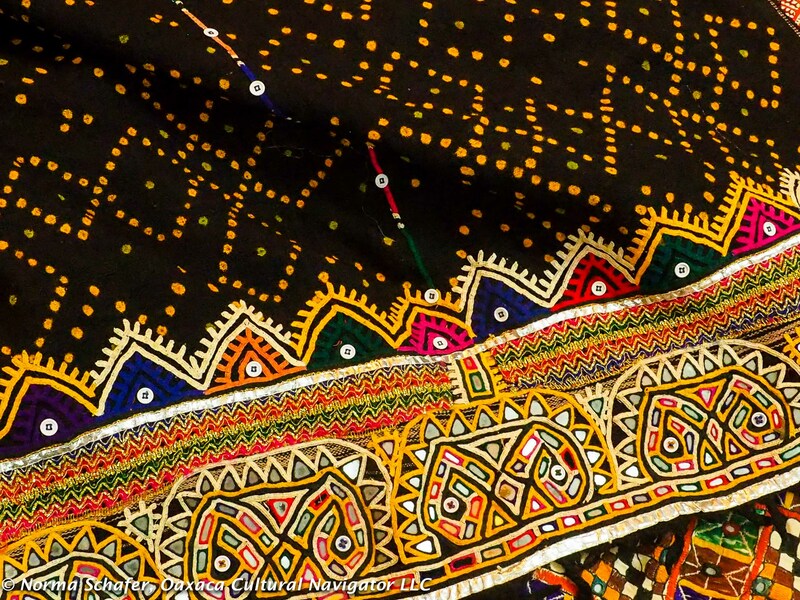 Rabari women in another workshop also follow a designer provided pattern. If a boutique owner or retail client orders 100 handbags, he or she may expect that while color may vary, design will be consistent. If there is deviation or variation, something may not sell and then the risk is that the worker and the organization will no longer receive orders and then go out of business. What price will be paid for quality consistency and uniformity? 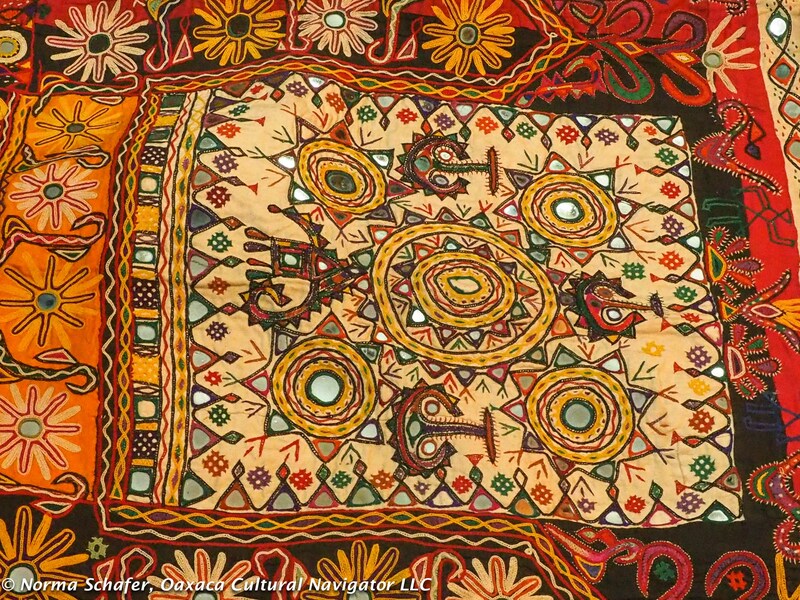 Will the naive, free-form folk art design produced for self-use disappear in favor of making something more polished that will then be sold at a higher price to foreigners? What about making goods for the local market vs. the foreign market? I was told repeatedly that woven goods are now being made with acrylic because it is cheaper to produce and that is what local people will buy. What is the cost and the loss for using cheaper raw materials and industrial mechanization? I’d love what she’s wearing! 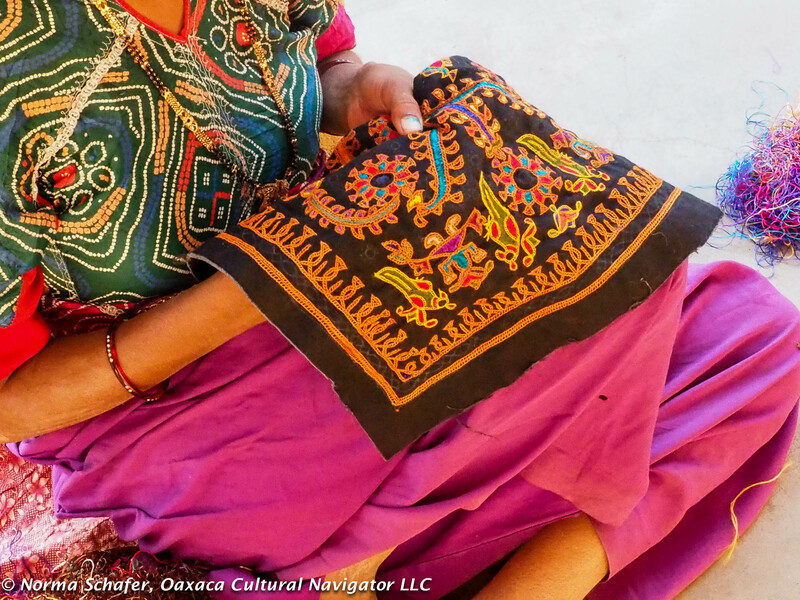 It is difficult to find artisans in India, as well as in Mexico, who are still working in natural dyes because the process is longer and the investment in raw materials is much higher. 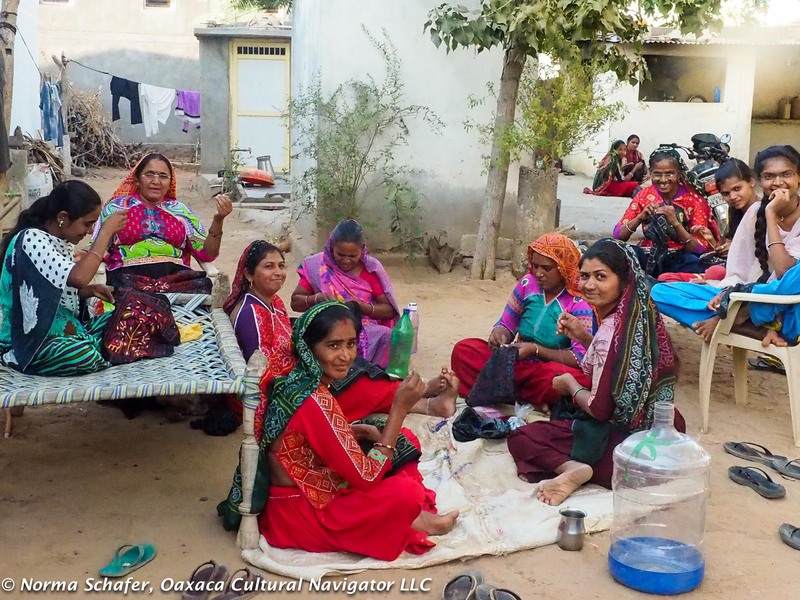 The tourist season in Gujarat, India is about four months long, from November through February, about the same as in Oaxaca, Mexico. It’s the dry season, easier to travel. Yet, this is the hottest December that people in Bhuj can remember. There is no global warming, right? And, this year, because of India’s demonitization crisis and no access to cash currency, about 60-70% of international tours cancelled. This region that depends on tourism is being hard hit. Sound familiar to those of you who visit or live in Mexico? 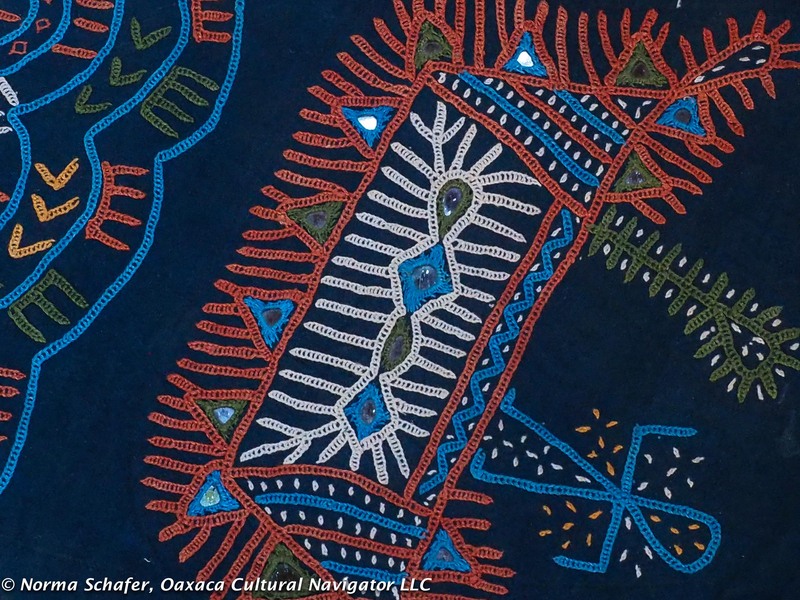 I’ve heard stories about embroidery designs from one tribal group that are co-opted and used by another because it is more popular. 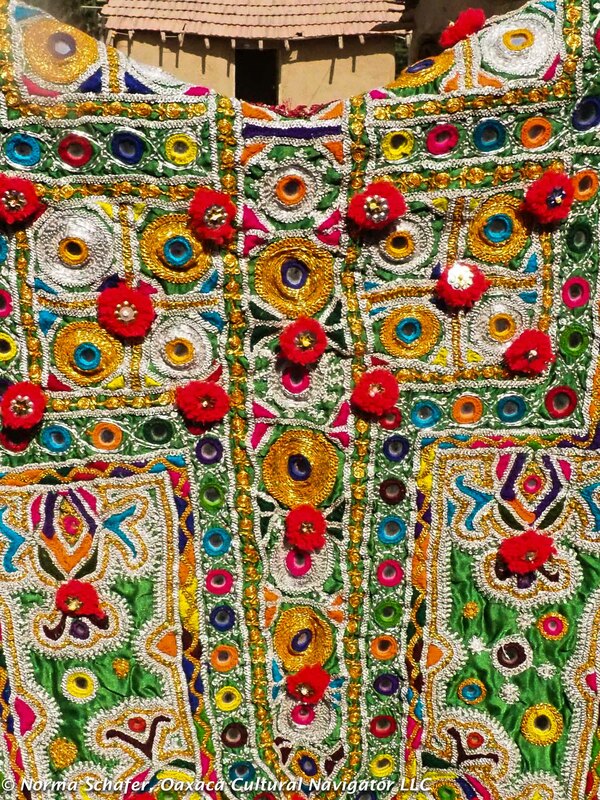 I have heard about a village that weaves a piece of cloth which is sent to another village for embroidery embellishment. Neither is credited with for the work. 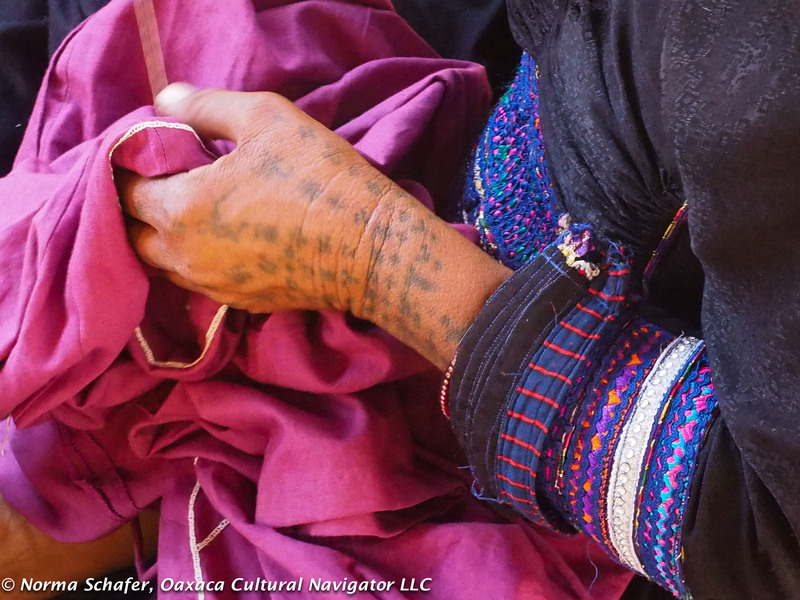 Rabari women’s hands make quick work; tattoos and cloth, key symbols of identity. 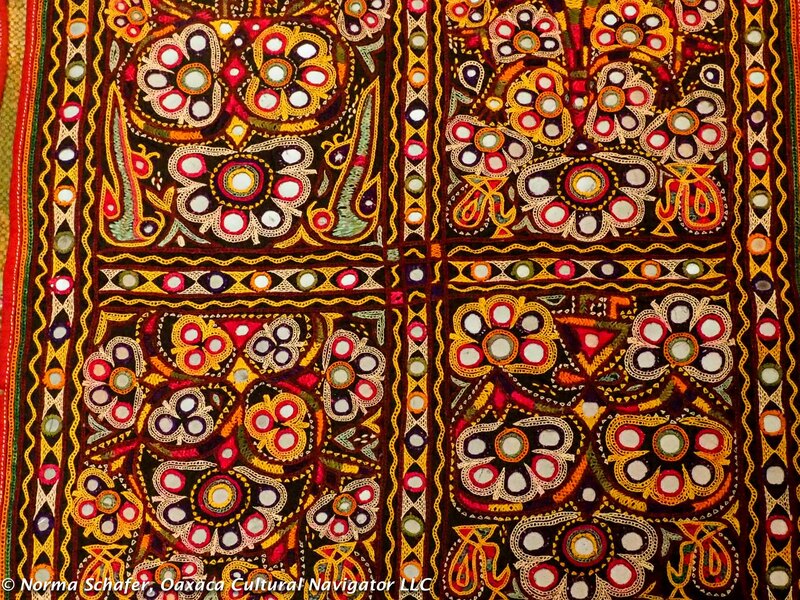 Since cloth is about identity, does this practice contribute to loss of cultural identity? Who is responsible for this loss? 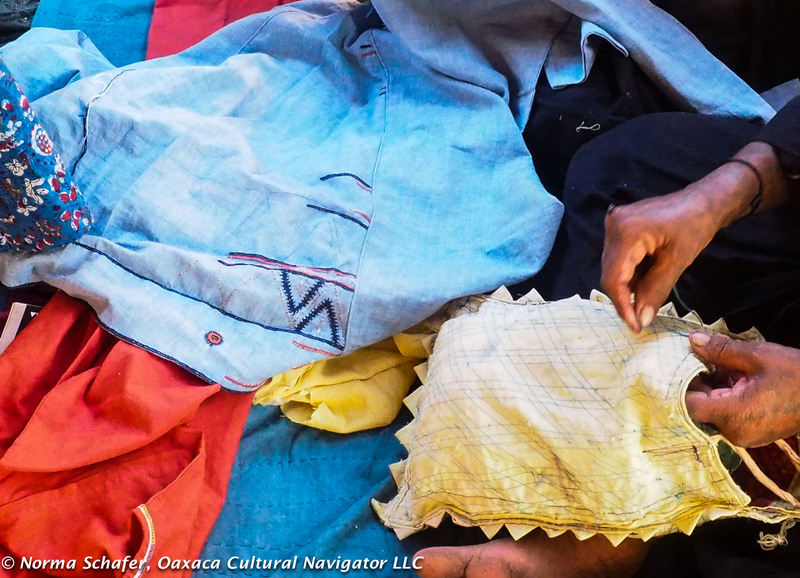 How do we put value on what is made by hand? Are we willing to compensate or are we looking for a bargain, at whatever the cost to the maker? I’m writing this blog post from the airport in Seoul, South Korea. It’s 10:50 a.m., December 14 here. I will be back in California, USA by 8:30 a.m. December 14. Go figure! The international news is daunting, and the prospects of a new presidency are depressing as cabinet appointees are named. I’m still apologizing, especially to the terrific Muslim people I have met along this Path to and from India. Old block print, made with madder root, backs vintage textile.